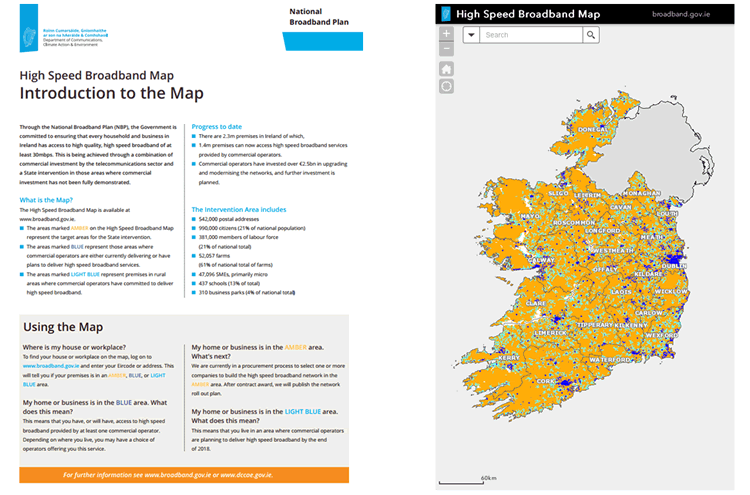 The High Speed Broadband Map identifies locations and premises as being AMBER, BLUE or LIGHT BLUE. AMBER areas - which are the target areas for the State Intervention of the National Broadband Plan. BLUE areas - where commercial operators are delivering or have indicated plans to deliver high speed broadband services. Operators are continuing to enhance their services in these areas to improve access to high speed broadband. Please contact us at Broadband@DCCAE.gov.ie to let us know if you cannot get High Speed Broadband from the providers in your area. LIGHT BLUE areas - new areas where commercial operators have committed to deliver high speed broadband in rural areas. The commercial rollout to these areas is primarily Fibre to the Home (FTTH). By 2018, all homes and businesses in these Light Blue areas can expect significant improvement to their broadband services. Zooming in on the map. If your premises footprint is not on the map please let the Ordnance Survey Ireland (OSi) know. Eircode, Ireland's National Postcode System was launched on 13 July 2015. An Eircode is a smart location postcode for all Irish addresses. Unlike other countries, where postcodes define clusters or groups of addresses, an Eircode will identify an individual address – rural or urban – and help show exactly where it is located. This means every residential address and business has a unique Eircode. There are a number of benefits to using Eircodes, the delivery of goods and services is easier and in a medical emergency an address can be quickly identified saving valuable minutes. You can continue to use your address as you usually do, simply add the Eircode on a separate line below the county. Capita Business Support Services Ireland, trading as Eircode, was awarded a 10 year contract in December 2013 to develop, implement, maintain and promote the use of the National Postcode System 'Eircode'.